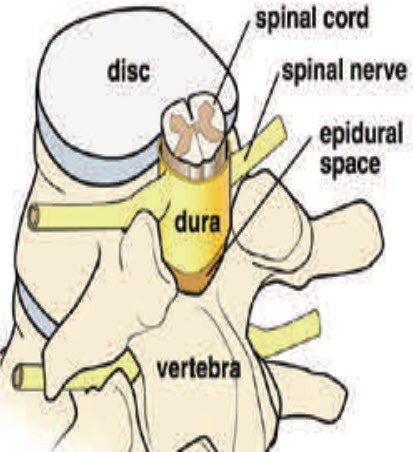 The epidural space is the area between the dura (covering of the spinal cord) and ligaments that connect the vertebrae. Injecting steroid into this area can help symptoms associated with spinal stenosis, spondylolysis, disc degeneration or disc herniation. 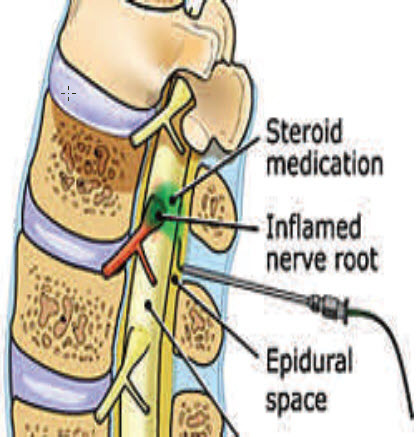 The epidural injection delivers a longlasting steroid and an anesthetic agent to the irritated and inflamed area or nerve. Injection often allows patients to resume a more normal activity level. This approach is used for treatment of multiple inflamed nerves or segments. The needle is placed between the lamina of two vertebrae. This allows medication to spread up and down as well as to both sides within the epidural space. This method is helpful when the exact pathology is not known or when multiple areas of pathology exist. 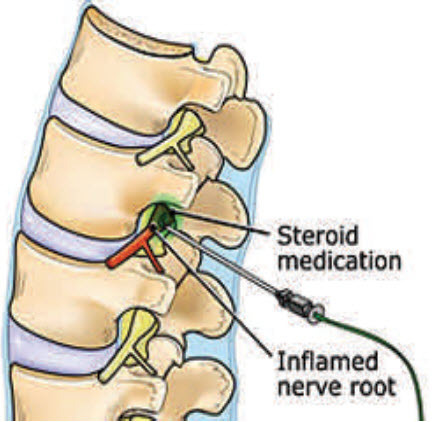 These routes are preferred when there is a clearly identified area of pathology or the response to an injection is needed to diagnose the affected area (selective nerve root block). They may also be helpful when the translaminar route fails to give an adequate result or when surgery has changed the anatomy making the translaminar route infeasible. The needle is placed to the side of the vertebra near the hole (foramen) of the affected spinal nerve. Contrast dye is used to identify the outlining of the nerve. If you are taking blood thinners or supplements, we may ask that you discontinue them prior to your procedure. Never stop these medications without approval from the physician prescribing them. Please call our office if your blood thinner is not listed. If you are taking any supplements such as Fish Oil, Garlic, Ginseng, Vitamin A&E, Ginger, Kava Kava, Clove, White Willow bark, or Gingko please stop these 7 days prior to your procedure. © Physicians Pain Services 2019. All rights reserved.